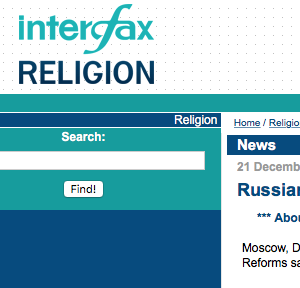 Interfax Religion reports that about $3.6m has been allotted to Orthodox organizations in Russia in several years. The Russian Orthodox Church is one of the main receivers of presidential grants, the Center for Economic and Political Reforms says in its report posted on its website. According to its information, at least 63 grants were allotted for Orthodox themes in 2013-2015, their sum totals to $3.6 million. Structures of the Moscow Patriarchate and organizations close to it received the funds. Majority of the grantees are located in Moscow, regional Orthodox branches are also among the leaders. According to the reporters, ‘Orthodox’ grants support state policy. About $28,6 thousand was directed to the Orthodox youth information agency Vera i Deloand formation of patriotically-minded bloggers on its basis. About $114 thousand was granted to educational readings Prince Vladimir. Russia’s civilizational choice held in the context of Crimea and Russia reunion.